Things are hotting up in the Royal London One Day Cup south group - and Sussex may need to win both their remaining games to secure a top-three spot and a place in the knockout stages. An unchanged Sussex Sharks squad has been named for Friday’s encounter with Glamorgan at Sophia Gardens. The fixture is Sussex’s penultimate match in the South Group ahead of Essex Eagles’ visit to Eastbourne on Sunday. The Sharks currently sit in sixth place in the table by virtue of having fewer wins than the four sides above them also on six points. After starting the campaign with two wins and two losses, the side have had their previous two games against Gloucestershire and Surrey abandoned without a ball being bowled. 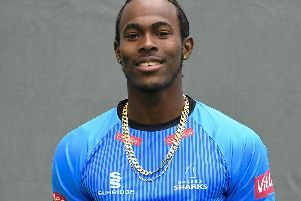 Despite completing their group fixtures on Sunday, Sussex will have to wait until next Wednesday – when the other eight sides in the group play their final matches – to discover if they are amongst the three teams that will progress to the knock-out stages. Ahead of Friday’s game in Cardiff, head coach Jason Gillespie said: “We’re looking forward to actually playing some cricket after two washouts! Supporters can follow Friday’s match on the Sussex Cricket Match Centre, which includes a live scorecard, live stats, text commentary and access to BBC Sussex’s ball-by-ball radio commentary. Play is scheduled to begin at 11am.